Junto al Rio beachfront vacation rentals in Sayulita Mexico. Right at the beach and by the river mouth, under the shade of coconut trees and surrounded by lush tropical garden and mangroves, Junto al Río offers the perfect choice to enjoy Sayulita's beauty and tranquility. 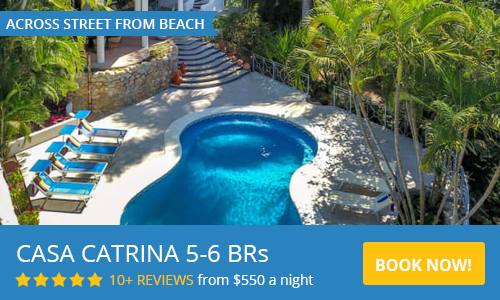 Enjoy one of Mexico's most beautiful and unspoiled beach villages on the Pacific at Junto al Río where the bungalows are a quiet and inexpensive beachfront accommodation to suit different Sayulita vacation budgets. We offer free high-speed internet and wireless service to our guests, We also offer pick up and drop off airport service to and from Sayulita (extra charge). Great location on the Pacific coast in a tropical climate. The bungalows are basic but full of character and due to the location it's possible to forgive the sandy floors and the bugs. The hotel is well positioned on the beach just a short walk from Sayulita town center where restaurants for breakfast and dinner are located. It is a self catering hotel with basic amenities and a very friendly beach bar complete with all the cocktails and Colima Craft Beer, which is excellent, alongside the ubiquitous Pacifico. If you want a barefoot relaxed stay away from hustle and bustle, with an opportunity to release some Olive Ridley turtles between Oct and December, this is the place to visit. We will return to Sayulita because it is one of the most idyllic beach towns anywhere on the planet. Every year my husband and I, keep on coming back to this place we consider our second home. We LOVE Ignacio and all the stuff that are super nice. The place is simple down to the point. all you need on a beach front bungalow, I would not look any further & book your chill stay here! The place is great, you can literally hear the ocean while you sleep and there are a lot of birds in the area. The rooms are great, but I wouldn't mind if more of the rooms had A/C. The personnel is really kind. If you are after a relaxation holiday and don't care about all the amenities like TV etc, then this is the place. Nestled right up against the beach it was only a quick 5 minute walk to the cobble stoned streets of sayulita. The beach bar is incredible! Hammocks, swing chairs and awesome margaritas! Some con's - when we were there the internet was not operational which was annoying. Also as it was rainy season, at times some horrible stenches drifted up from the near by river. Finally, it is difficult to swim at the beach directly in front of the beach bar due to a large number of rocks, but it was only a small walk to the main Sayulita beach. I would highly recommend this spot for people looking for a getaway that is about relaxation in a simple environment. If you need all the creature comforts this is not the place for you. It's rustic and not perfect but it's perfectly rustic. We have stayed here 3 or 4 times and I just spent my birthday here with 10 friends. You can hear and see the ocean from almost every room and step out your door onto the sand. And the birds! It's a veritable symphony every day at dusk. So many amazing tropical birds & iguanas everywhere. Birders will be very happy. Decent surf right in front, I've heard it can be great but have always ventured to away from Sayulita for better waves. And hands down, the best beach bar I've ever been to. Picture it it your head and its here! The food is really good, as is the craft beer bar & restaurant in the front. The rooms are clean and very comfortable with great hot water, ceiling fans, windows that open to ocean breezes, little kitchens with mini fridges & hot plates and awesome on-site massage. Some rooms have AC but we've never used it (maybe in their summer its needed). The only thing in the room I wished for was more wall hooks. Free wifi but works best in common areas. We have never smelled anything from the water purification plant next door but have gotten bitten by mosquitos. Come prepared! We stayed in a bungalow for 3 nights and it was perfect. You can walk right out to the beach where there is a restaurant and beach chairs for you to hangout at. There is also a bar/restaurant near the entrance with craft beer from Mexico. The bungalow itself is kept clean and in good condition. With two double beds and a loft with another bed there was more than enough space for our stay. The kitchen comes equipped with everything you need if you want to make your own breakfast/lunch dinner. The staff is very friendly and helpful. They were willing to take time to show us where certain things were and give suggestions. The location is perfect as it is a short walk to the "main" part of town and smack dab in the middle of the beach. The wifi is a little spotty, but why spend time on the internet when you're at the beach? If you're looking for something different than your usual hotel and want to feel like you're sleeping on the beach, this is a must stay. We enjoyed the rustic feel of Junto al Rio and thoroughly enjoyed relaxing to the sound of the ocean right at our doorstep. Hammocks, hanging beds, beach chairs and umbrellas for guests as well as the on-site bar, restaurant and massage tent. Hot water shower pressure was the best we'd had on our 3 week Mexico trip. We were in a 2nd floor unit which was accessible via a spiral staircase typical of many places we've stayed but not good if you have mobility issues. The rooms are rustic and didn't feel as clean as some other places we stayed on our trip but it had the basic amenities we needed for our 3 night stay and was reasonably priced for the location. Yes, there is definitely a septic smell at times as the property is right beside the septic station but fortunately the wind mainly blows in the right direction to alleviate the smell. We stayed at a property for the first 4 nights of our Sayulita stay up on the hill and could sometimes smell the septic even up there. With regards to the reviewer who commented about toilet paper only allowed in the trash basket, obviously they have not travelled through much of Mexico as we have found this to be common practice not just in beach towns but also in inland cities such as Guanajuato. As well, I am not sure if the sewage had anything to do with the issue of getting sick in Mexico. Both ourselves and our friends have always gotten sick on extended stays in Mexico no matter how cautious we have been in terms of water and food. In several cases, it has been after eating at high end resort restaurants when the stomach trouble started. Anyhow, in summary, if you are looking for a laid back somewhat rustic and affordable accommodation right on the beach, right by the Centro and yet still quiet and relaxing, Junto al Rio is a good choice. We LOVED the location, staff and laid back feel of this place. There was a lovely oceanfront bar and great vegan restaurant literally one minuet away. The bungalows were nestled in the lush, jungle like atmosphere with a beautiful view of the Ocean. However, this property is directly next to "the river" which is pretty much the sewage draining from the city. The stench was horrible, especially at night. It really put a damper on an otherwise perfect vacation location. Hello Amber, thank you for your review. We're sorry you had bad luck with the river while you stayed with us. Sometimes a pipe breaks and unfortunately drains water to the river. We're happy to know you enjoyed your stay at our property. The grounds at Junto al Rio in Sayulita are just lovely. The beachfront bar is a great spot to enjoy a shady afternoon or to watch the sunset. The food and cocktails here are very good, and service is always top notch! It was the perfect spot to enjoy a margarita with our toes in the sand while staring out at the ocean under the shade of a palm tree. Tropical paradise found! We will be back. The most unique accommodations I have stayed in--Amazing experience! The grounds and rooms are beautiful and more than we expected. The open air experience was new for us and we enjoyed the sound of the ocean at all times. The protected courtyard for guests only provides hammocks and lounge chairs to relax. The beach bar was our favorite thing in Sayulita! The view, the swings, yummy margaritas, and shrimp tacos were highlights for us. Our hosts were so friendly. We want to come back! We learned that Easter week is a very busy week which makes the noise level (in town) much higher during the evenings. The resort, however, does everything it can to provide peace to its customers. I am thankful for their watchful care and consideration. SPECIAL: 20% off drinks at our beach bar to hotel guests!